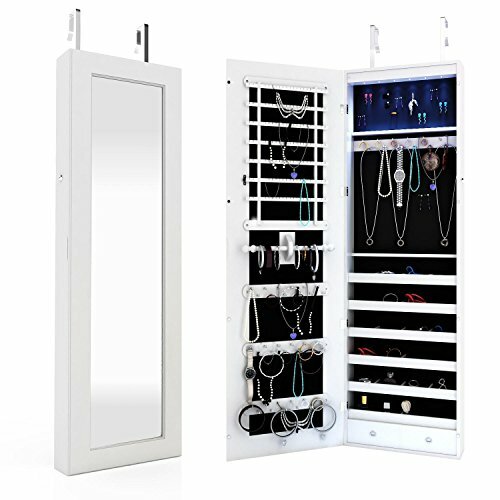 The jewelry cabinet either can be mounted on wall or hanged over the door via hooks. Easy to assemble. Effortlessly and time-saving. Perfect for living room, bedroom, Jewelry shop. Add it will in these places will help you organize essentials and make your morning routine a lot smoother. Gone are the days of spending three hours trying to find the match to your favorite chandelier earrings. ***EASY TO ASSEMBLE - You Just Hang it Over The Door or Wall Mounted With Screws and Brackets. ***DURABLE AND ELEGANT - This Jewelry Cabinet is Made of Premium MDF With Elegant Black Velvet Interior Lining. ***FULL LENGTH MIRROR - Perfect for Applying Makeup, Viewing Outfits and Overall Convenience of Getting Ready. [ LARGE STORAGE CAPACITY ] - 144 Earring Holes, 78 Compartments for Rings, 48 up and down hooks for necklaces, bracelets, chains and other valuables; 6 shelves for glasses, perfume, tie, watch, etc, 2 Bottom Drawers for Small Accessories; 1 Solid Wood Rod for Scarf and Ties.It can meet your long-term storage needs. [ SPACE SAVE DESIGN ] - Mount on the wall or put on the door, it won't take up any floor space; Attached tightly , no need to worry about wobbling or toppling.Cabinet Measured 14.57 x 3.94 x 47.24 Inch (L x W x H). [ BEVEL-EDGE & MIRROR ] - Full Length Framed Mirror Offers a Head-to-Toe View of Your Outfit. If you have any questions about this product by Elever, contact us by completing and submitting the form below. If you are looking for a specif part number, please include it with your message.